a doggy tale. | there's no place like gnome. There’s something I didn’t tell you last night. She might come live with me. *clears throat* About that name. As a pastor – really, just as a human being – I refuse to stand outside and call loudly, “Angel!” Especially when the neighbor dog has such a cool name – Neutron. You know my brother has yellow lab too. Jetta is right around five years old too. Perhaps that’s why I could love Angel and want to give her a home. She reminds me of the lab mutts we always had growing up and specifically of Jetta dear. It’s not the best photo in the world; she was anxious to go outside and couldn’t believe I was making her sit. This was the one photo she let me take while I visited her in Alaska. I think I was just a friendly stranger to her now; she’s forgotten her auntie. sniffle. I’ll keep you posted on my application process and should the humane society decide that I would be a responsible doggy mommy, the tales which follow will be plenty. 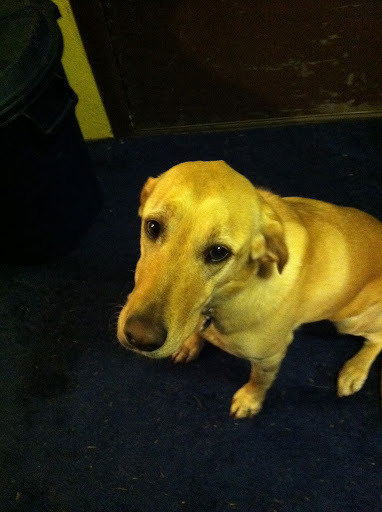 So many tales that you may curse this blog and wish I never got a dog in the first place. You’ve been warned.